On its own, Game Of Thrones has become an absolute sensation over the last several years – something like the TV equivalent of the Harry Potter or Lord of The Rings franchises. People around the world tune in to watch, plot speculation is rampant across the internet, and in some cases people research specific odds for different events that might happen in the show (and even place actual bets!). It’s surpassed television, in a way. Whether you’re talking to friends on a Monay morning about Sunday night’s episode, ordering the beer and wine that’s been made under the franchise label, or even placing bets on which character could die next, you’re participating in a global pop culture event of sorts. The extreme version of this participation is world travel to different destinations used in the filming – one of which happens to be Dubrovnik. 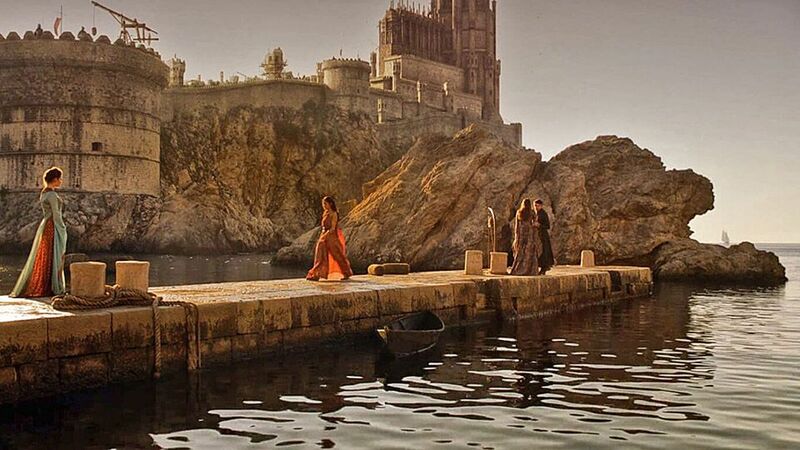 The city, as we’ve written, was picked as a model for the fictional capital of King’s Landing, and has been one of the main location staples of the show. While there is some CGI used to expand upon the city and make it more like part of the fantasy realm people have come to know and love, you can actually recognize aspects of King’s Landing when you visit. This is certainly one reason the city has become so trendy in recent years. The only trouble is that it’s also become more crowded. At this point, as a matter of fact, the government is even looking to restrict tourism to some degree. But that’s no reason not to go to Croatia! Even if Dubrovnik appears to be restricted, or too crowded, there are some wonderful alternative destinations that offer much of the same charm without the hassle or bustle. Southeast of Dubrovnik on the Adriatic Coast, Cavtat is one of the most obvious alternative destinations. While it doesn’t have the same fortress-like setup as Dubrovnik, it does have a charming Old Town, and its surroundings are every bit as beautiful as those at Dubrovnik. Clear blue waters, lush trees and surrounding hills make it look like something out of a painting. Near the Italian border, Pula is a fascinating city in its own right. It was first settled in prehistoric days, meaning there’s effectively been some kind of village or city there for the bulk of human history. It was also occupied for a time by the Romans, as evidenced by various ruins – including a coliseum near the water. It’s a gorgeous, fascinating town to visit. Zadar is on the Dalmatian coast, well to the northeast of Dubrovnik and somewhat unique on this list. It’s a little bit more modern looking in general, but is still right on the water with excellent beaches in the area. Zadar does have an Old Town, which is actually on its own small peninsula jutting off of the mainland, and there are Roman and Venetian ruins alike that make it a fascinating city to explore.